It’s funny what two games can do. After a head-scratching performance at the Old Spice Classic, Temple basketball fans were ready to hop off the bandwagon. Now, after impressive back-to-back wins over Maryland and No. 10 Georgetown, I’d say the Owls officially put Orlando in their rear-view mirror. Do people not understand that this squad historically gets off to slow starts. One thing before I get into the rest of my story, let me just pose the question. Why did the students rush the floor last night? Really!?!? I realize Georgetown is ranked in the top ten, but this was a game that Temple should’ve won and did. It was not an upset. The Georgetown game had a similar feel to last season’s Villanova contest; not from the aspect of beating a top ten team, but from a star emerging in front of our eyes. Ramone Moore broke out, similar to Juan Fernandez’s dazzling performance against the Wildcats last year. Both players took over, but in very different ways. Fernandez had a career-high 33-points in his astounding shooting performance against Nova. The Wildcats never had an answer as three-after-three continued to split the strings. He knocked down seven from beyond the arc on the night. Moore had career-high 30-points last night, mostly coming from transition and his silky-smooth mid-range game. He was 12-for-18 from the field. Heading into the year, Moore was supposed to be the guy to take the scoring role from the departed Ryan Brooks. I’d say he’s starting to fill that role quite nicely. Even after those nice two wins, the Owls still have to improve on closing out games. In the final five minutes of games, I still don’t understand why Temple gets into clock draining mode. The offense has no rhythm, and remains stagnant. At least they hit their free throws last night. Rahlir Jefferson calmly hit some critical free throws down the stretch. Juan Fernandez and Lavoy Allen continue to struggle from the offensive end, especially Fernandez. At least Allen brings it every night on the defensive end. Fernandez is shooting just 22.2 percent from beyond the three-point line this season. Congratulations to Fran Dunphy who won his 400th career basketball game last night! He’s the second Big Five coach to surpass that milestone. John Chaney had 516 wins in 24 seasons at Temple. Before playing Villanova on December 30th, the Owls face three MAC opponents; Akron, Northern Illinois and a road game against Ohio. Don’t overlook that Ohio game. This is the team that upset Georgetown in the first round of last year’s NCAA Tournament. Temple basketball has a long way to go to reach their desired expectations when March rolls around. The Owls went 1-2 at the Old Spice Classic including losses in the First Round to Cal 57-50 and to Texas A&M 54-51 in the 5th Place Game. Hopefully for the Owls sake it was just one of those bad weeks. The offense looked very stagnant as the Owls just continually settled for jumpshots. 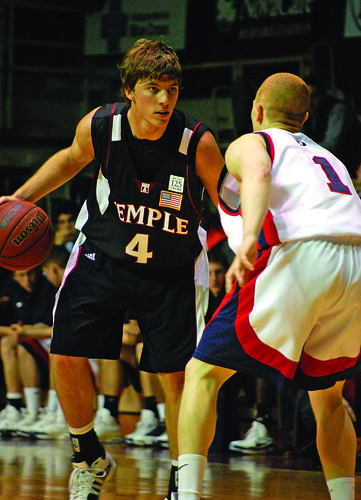 It seems to me so far that Temple is missing the on-court leadership and scoring from the departed Ryan Brooks. The Owls need either Juan Fernandez or Lavoy Allen to step up and fill that leadership role. Neither is really built to lead; both are quiet guys. In five games so far this season, Temple is shooting 19/80 from three (23.8%). Juan Fernandez is just 4/23 from downtown as he’s yet to get it going. Ramone Moore is currently the only player averaging double-digits (10.8 ppg). I’m still waiting for Lavoy Allen to step up offensively. He needs to stop being so passive. Allen can score when he wants to. Temple did have some bright spots from Orlando as two players in particular emerged; sophomore guard Khaliff Wyatt and junior forward Scootie Randall. Wyatt barely saw the floor as a freshman because of his lack of defensive intensity. During the offseason, Wyatt trimmed down and is playing the defense that Dunphy hoped for. Randall had a team-high 18-points in their win against Georgia. Even with the offense struggling, the defense still shows up every night. They have yet to allow 60-points in a game so far this season. They’re allowing 54.5 ppg thus far. All in all, Temple missed out on some quality win opportunities in the tournament to boost their RPI. They did get the win against Texas A&M. Hopefully the Owls fixed some of the kinks because the schedule doesn’t get much easier. After a “should be” win against Central Michigan tonight, the Owls go on the road to play Maryland and get Georgetown at home. The Temple basketball program is slowly returning to the success it had during the John Chaney days. The next step is to win an NCAA Tournament game. In 2008, the Owls lost to 5th seeded Michigan State. Temple lost to 6th seeded Arizona State in 2009, and last year they got upset by 12th seeded Cornell. This is the first year that the Owls head into the season as the clear favorite in the Atlantic 10 in about a decade. Will they be able to handle the pressure? They were supposed to take a step back last season after the departure of Dionte Christmas; but underclassmen such as Lavoy Allen and Juan Fernandez really stepped up. They really put themselves on the map after a non-conference home win against Villanova. They finished last season’s campaign ranked 12th nationally. The only question that I have is who will step up and be that shutdown defender in the backcourt. Ryan Brooks and Luis Guzman were fantastic on the ball defenders. Temple wins by shutting down the opposition. They led the A-10 in scoring defense, allowing just 56.8 points a contest. They held ten of their opponents to 50 points or less. Eric is solid defensively around the basket area. He doesn’t really have a lot of range on his jump shot. Allen is a guy that I’ve seen grow since his high school Pennsbury days. He’s transformed from a very skinny high school kid to a mammoth. I will never forget his first half performance he had against Harry S. Truman, the school where former Niagara guard Tyrone Lewis attended. Allen blocked 10 shots in the half. He was all over the place. He’s brought his smart defensive instincts to Temple. Allen averaged a double-double last season; the first Owl to do so since 1970-1971. He’s as good a passing big man as any big man in the country. He’s as fundamental as they come. If there is a complaint about Lavoy, he can be a bit too unselfish. He can routinely knock down mid-range jump shots if he wants to, but he continually gives up those shots. I’d like to see him more assertive on the offensive end. Especially now as a senior. Jefferson looks like the guy that will take over Brook’s defensive duties. He can cover both guards and forwards. The Chester grad showed some promise last year, but will he be able to fill a bigger role on the team this season? Moore won the A-10 Sixth Man of the Year Award, but he really came on halfway through the year. While Jefferson looks to step in and be the defensive stopper that Brooks was, Moore looks to be the scorer. Moore consistently gets to the tin, and when a defender plays a bit off, he can step up and knockdown an open jump shot. 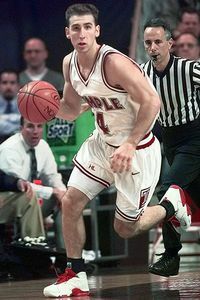 Temple basketball historians proclaim Fernandez to be Pepe Sanchez with a jump shot. I understand the comparisons. They’re both from Argentina, but I think they’re games are different. Sanchez was more of a pure passer, and was a very reliable defender. He didn’t shoot the jumper extremely well, but he seemed to hit it when it counted. He always played under the control and took care of the basketball. Fernandez is a bit of a liability on the defensive end. Offensively, Fernandez can do a bit of everything. Unlike Sanchez, Fernandez can create his own shot. They both have high basketball IQ’s; they’re always a step ahead of the defense. Williams is a big man that can knock it down from beyond the arc. Considering his size, he should be a better rebounder than he is. Randall is a guy, despite his size, who can get the job done inside. 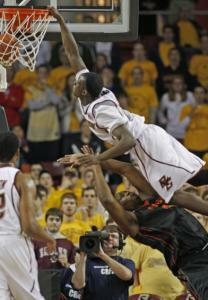 Fran Dunphy usually doesn’t play freshman that much, but Brown can be an exception. He comes from St. Benedict’s Prep, an established program in New Jersey. Dileo is a scrappy guard who hustles on every play. He’s a Luis Guzman clone. Clarke red-shirted last year after transferring from Pensacola (FLA) Junior College. 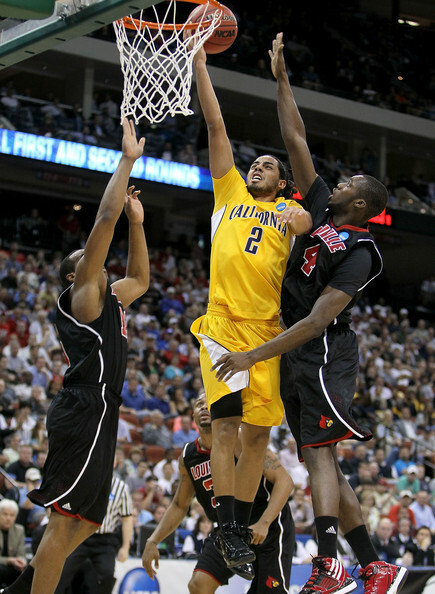 Juan Fernandez and Lavoy Allen are Atlantic 10 Player of the Year candidates. I want to see Allen be more aggressive. The guy that I’m going to keep my eye on is Ramone Moore. I expect him to break out and have a huge year. I’m curious what kind of production the Owls will get off the bench. Craig Williams is the only senior off the bench. Aaron Brown has been hyped, but how many minutes will Fran Dunphy play him. Obviously, the expectations on Broad Street are high. A sweet 16 appearance is possible, but the Owls have to win a game in the NCAA Tournament first. I think the Owls will win their fourth consecutive Atlantic 10 crown, and get a four seed in the NCAA Tournament.